Why You Should Be Concerned? The Health Policy Institute, part of the American Dental Association, recently conducted a survey of around 15,000 people across the U.S., asking them about problems with their teeth and gums. Three issues in particular stood out, each affecting about one-third of those surveyed. Here are those top 3 dental problems that plague Americans and what to do about them. Tooth Pain. As with other parts of the body, tooth or mouth pain is a sign of something wrong — in some instances ignoring it could lead to tooth loss. Because there are a number of possible pain sources like tooth decay or periodontal (gum) disease, anyone with tooth pain should see a dentist for an examination to pinpoint the actual cause. That will determine what kind of treatment will remedy the problem and stop the pain. Difficulty with Chewing. For 31% in the ADA survey, chewing food was a difficult and often painful task. The consequences go well beyond the mouth: with less chewing efficiency a person may be unable to eat certain foods that supply his or her body with essential nutrients. 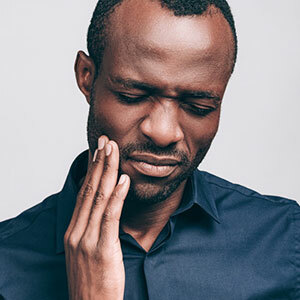 Like tooth pain, there are a number of possible causes: cracked or deeply decayed teeth, enamel erosion or recessed gums that have exposed sensitive tooth layers, or poorly fitted dentures. Finding and then treating the cause of the difficulty could help restore chewing ability. Dry Mouth. The most prevalent dental issue in the survey was chronic dry mouth. It's more than simply being thirsty: chronic dry mouth usually stems from inadequate saliva flow. It's often caused by some systemic diseases or as a side effect to a prescription drug. Saliva helps neutralize decay-causing acid and supplies antibodies to fight infection. Without sufficient flow a person is more susceptible to diseases like tooth decay and periodontal (gum) disease. Changing medications or using products to increase saliva could help prevent these dental problems. So, have you experienced symptoms for any these common oral health problems? If you have, be sure you see your dentist as soon as possible for diagnosis and treatment. If you would like more information on symptoms of dental problems, please contact us or schedule an appointment for a consultation.